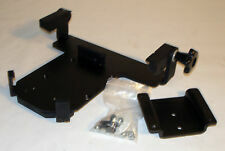 VESA mount accessory PV02 for XG41 and XH61(V) series Slim PCs. Compatible with Shuttle XG41, XH61 and XH61V Slim PCs. - VESA mount. 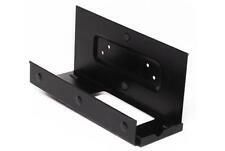 Supports 75 and 100mm VESA standards. 1 Year Shuttle Warranty! This product carries a Full 2 Year Shuttle manufacturers Warranty. The RAM® Universal No-Drill™ Laptop features a heavy-duty steel mounting base designed to fit a variety of vehicles. 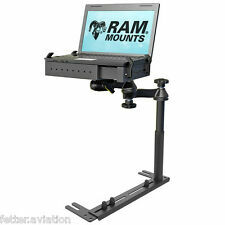 RAM Universal No-Drill™ Laptop Mount for Cars & Light Trucks. The tray includes four (4) side clamping arm with rubber grip feature. The difference from the Video is that we include the upgraded Aluminium bracket for any size tablet 7-13" including IPAD PRO 12.9" and MS surface pro or any biggest tablet. ( The black plastic knob bracket shown on the video breaks easily and it dose not tilt or turn widely. ). FEATURES: ---Connect your iPad or Android Tablet to the screen of your laptop for a unique new dual-display computing experience ---Ideal for increasing productivity while on the go, away from the office, library or studio. At 15 1/4" x 13 3/4", this model is still able to hold most laptop computers and is perfect for paperwork. The accessory holes and/or pencil grooves featured on the other models are absent on this model. The C-desk has 3 holes top left for writing utensils/keys and has pencil grooves on both sides. The uses for this desk are limitless. When driving or not in use, tuck it away between your seat and your center console. ADDB is a cost-effective solution for CPU storage. Colebrook Bosson Saunders Adjustable ADDB / TRS CPU Mount/Holder. Removes the CPU from the floor, fastening neatly to the underside of the desk. It is not the slide and rotate one which has the separate mounting bracket. RAM No-Drill™ Laptop Mount for the 2011-2018 Ford Explorer and 2013-2018 Police Interceptor Utility. Ford Police Interceptor Utility (2013-2018). Mounts on the passenger side floor board, in front of seat. Extra big bad for leg comfort. ( Easy installation and detachable from chair ). 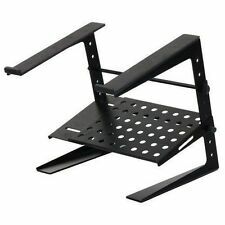 The laptop holding tray can be folded to the side of your chair and the holder can be pushed away while you are not using it. The holder can be easily attached or detached from your chair. For ThinkCentre. For Lenovo, For IBM. Custom Bundle. Compatible Product Line. Computer Case. Product Key Features. ★ Praktisch: Kann auch als TV-Schreibtisch, Tablett, Bücherregal, Schreibtisch, Notebook-Stehpulte, Tontechnik, Vorlesungstisch, Projektor und Tablet-Halter verwendet werden, um alle Ihre Bedürfnisse zu erf��llen. Double Flapper the Notebooks of Different Thicknesses: Small Flapper For thin Laptop Bigger Flapper For Thicker Laptop East to use Without Installation. Easy to Carry:it is very light and beautiful. Only 200G, And You can put this stand in your schooldbag, Bigger Shoulder bag. Ergonomic tilt (tilt laptop to any position for comfort). Fully adjustable seat mounting hinge (flat or any angle). Adjustable mounting hinge goes to complete 90 degrees. Universal to all laptop computers. Lenovo 4XF0L68949. The ThinkCentre Tiny III Vertical stand can easily vertical your Tiny system to free up valuable desktop space. ThinkCentre Tiny III Vertical Stand. It is compatible with the ThinkCentre Tiny Systems. II Netbook Cradle Holder. Well thought out and compact designs are common place at RAM and our new RAM Tough-Tray II™ is no exception. Simple to install and adjust retaining arms insure a perfect fit without interfering with ports or functions. UPPERCASE KRADL. KRADL is up to 60% smaller than other vertical stands. Proudly designed by UPPERCASE in California. for MacBook Pro 13" & 15" (2016, 2017, 2018 ONLY). Machined from a solid piece of aerospace-grade aluminum alloy. Create a desk for work, reading or eating instantly in a few seconds! You can snap this flex desk into place with its adjustable height and positioning to angle it as you need for reading or working. Presented in a refined aluminium alloy, the surface of the Tekessentials Riser is soft to the touch, allowing your fingers to lightly brush over the surface. With a minimal and elegant design, theTekessentials Riser integrates seamlessly into any living space. 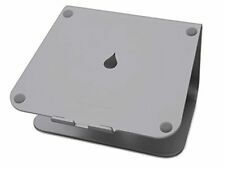 Kensington Desk Mount Security Anchor PointCreate a convenient - secure anchor point for your laptop lock. Add a secure anchor point to any work surface, providing employees with a convenient and easily accessible place to lock down their computer. Folding the table is easy and is done in seconds. Size when folded 52 x 28 x 5cm. Our laptop stand is built to last whilst being light and easily transported. The laptop platform has ventilation holes in it to allow your laptop to keep cool effectively. HP 3TK74AA. Output interface: HDMI. Minimum processor: AMD AM4 A6-9500E 3GHz, Minimum RAM: 4096 MB, Minimum storage drive space: 131072 MB. Width: 39.4 mm, Depth: 38.2 mm, Height: 19.5 mm. HP interface cards/adapter Internal HDMI. Ford F-250-F-550 (2019). The tray includes four (4) side clamping arm with rubber grip feature. These arms can be moved both vertically and horizontally. No-Drill™ Laptop Stand System installs quickly and easily using the existing hardware of the passenger side seat rails. ● Keyboard stash clears up desk area when not in use. The Enpee EE-S05 is a laptop stand with 360° swivel base, for professionals who require an elegant way to share the screen while enjoying stability. This could jeopardize the safety of you and your vehicle. Mobotron MS-526 Heavy-Duty Car VAN SUV. Sure-Grip Laptop Deck – With Extendable Rear And Front Sliding Bracket, The Deck Can Easily Secure Laptop (From 10” to 17”). 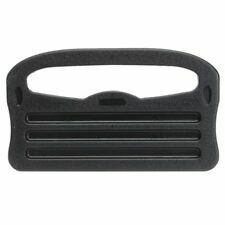 Foldable and mini, easy to carry, can be put in your pocket or pc bags. 1 Stand Tripod. Fit for tablet & laptop within 15". Built in clip arm, safe and shockproof. Make your device stay cool via enhancing the airflow. Van Racks & Accessories. Rain-Gutter Mount Racks. DODGE RAM PROMASTER (CITY). Truck Racks & Accessories. This model is a heavy-duty designed universal laptop stand which targeted the solution of in-car laptop or tablet devices uses. The Panasonic PDRC displays are touchscreen displays used with most if not all Toughbooks from Panasnic (CF-19, CF-30, CF-31, CF-U1, CF-H1, CF-52, CF-53, CF-54, etc). This mount system is intended for both the PDRC and the keyboard for permanent mounting in vehicles. PORTABLE DESIGN: Fully foldable stand condenses down to just 270mm x 29mm (290mm x 231mm x 160mm when open), making it easy to carry. 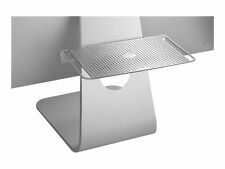 Aluminium risers and skid-free pads for desktop stability. Reclaim desktop real estate for your keyboard and mouse. Disassembles easily for travel APPLE LAPTOP NOT INCLUDED . ALSO COLLECTION IS NOT AVAILABLE. ,ipad Pro(12.9" ) MS Surface Pro or any tablet between 7-13". The holder tilt 180 degree up/down and turn 360 degree so you can watch the movie while lying on bed flat or look over the screen from top. GMC Savana Van (1998-2017). GMC Savana Cargo Van (2012). GMC Savana Passenger Van (2012). This No-Drill™ Laptop Stand System installs quickly and easily using the existing hardware of the passenger side seat rails. ESSENDO IL PRESENTE OGGETTO IN VENDITA ANCHE ATTRAVERSO ALTRI CANALI, IL VENDITORE SI RISERVA LA FACOLTA' DI CHIUDERE L'INSERZIONE ANCHE PRIMA DELLA SCADENZA. Your perfect workmate Reliving eye, neck and back strain, the raised and tilted positioning ensures comfortable working for extended periods. Clear desk, clear mind Integrated rear cable channels encourage an organised clutter free desk space. In those cases, if you open the cupholder before installing this mount you'll be able to use the cupholder although you not be able to close it again. 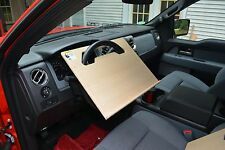 RAM No-Drill Laptop Mount for 2004-2014 Ford F150, Others. 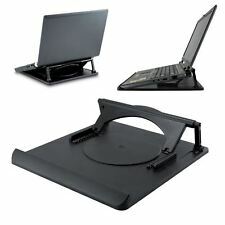 NOTEBOOK STAND & COOLING PAD. 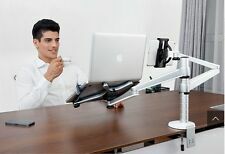 5 ADJUSTABLE ANGLE STAND. 14cm SPEED ADJUSTABLE SILENT FAN. FOR 9" - 17" NOTEBOOKS. ERGONOMIC DESIGN. Using a laptop in bed or reading your tablet on the sofa can be awkward. It’s hard to find the right position and hands and necks get tired. We designed this tray for both right and left handed users with work space on both sides of the tray. NexStand K2 Laptop Stand is an ultra portable, super lightweight laptop stand that transforms your laptop into an ergonomic desktop workstation. 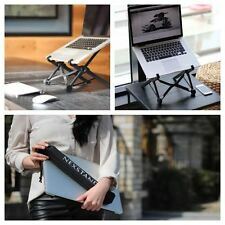 K2-Laptop Stand( upto 17" laptop). Raise up your laptop screen to your eye level so you do not hunch your back . Installation is fast and simple; attaches to an exposed seat anchor bolt. Double-socket arm allows rotation through 360 degrees and 270 degrees of tilt. The upper portion of the mount detaches with the turn of one knob, allowing you to recover valuable space when the mount is not in use.